Kurt Albert was fortunate to learn the art of American Rhythm Tap from authentic masters like Carnell Lyons (Kansas City, NYC, Berlin), Brenda Bufalino (NYC) and Buster Brown (NYC), who are his main influences. He although took workshops from Honi Coles, Cholly Atkins, Jimmy Slyde, Steve Condos, Eddie Brown, Fred Kelly, Prince Spencer, Cookie Cook, Fay Ray and Leonard Reed. 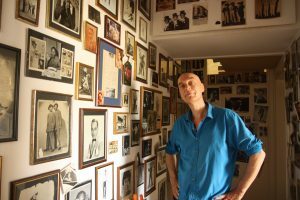 He was a member of Brenda Bufalinos „International Tap Dance Orchestra“, and since 1990 he has regularly been sharing the stage with Carnell Lyons, Brenda Bufalino and Josh Hilberman. For over twenty-five years he has been dancing with his partner Klaus Bleis in Germany’s best known tap duo „Tap and Tray“ with international appearences in USA and throughout Europe. Kurts credits include the New York City Tap City Festival, the Chicago Human Rhythm Project, the North Carolina Tap Festival, the Moscow „Tap Parade”, the Helsinki Tap Festival and the Rennes Tap Brezze Festival (France), the ARD TV Sportsgala, the „Jazzfestival on Sea“ and the Toulon Jazz Festival. In 2008 Kurt Albert moved to Heidelberg, where, in addition to his continuing work with “Tap and Tray”, he works in the Jazz Band “Melody Rhythm and Tap” with drummer Allen Blairman and saxophone player Olaf Schönborn. Many things connect me with Kurt Albert: We both grew up in Heidelberg, we are both musicians and for the last 25 years we were the only two fools in Germany who were constantly researching in tap history, giving talks and demonstrations. Last year we even enjoyed dancing together for two nights with a big band. I am very happy, Kurt is contributing some thorough biographies and great photos from his collection.